#2 DUKE 73, NORTH CAROLINA 68 - It wasn’t a classic, but it wasn’t for a lack of effort as Cameron, poor shot selection and awful free-throw shooting doomed the visiting Tar Heels agains the steady Blue Devils. 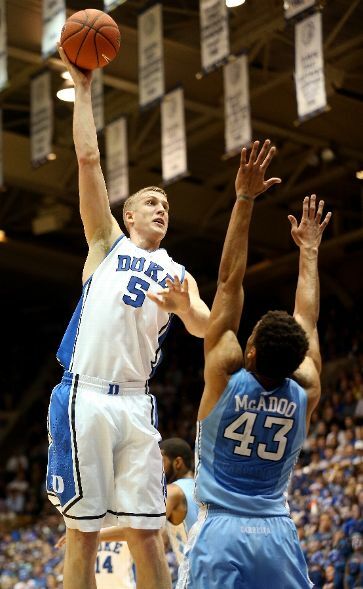 UNC had no answer for Mason Plumlee who led #2 Duke with 18 points. The Blue Devils shot 44 percent - 52 percent after halftime - and used a big run in the second half to erase a slow start and win their sixth straight this season and sixth in eight meetings in college basketball's fiercest rivalry. During that same period Carolina was throwing rocks - 34.3% and just 2-11 from behind the arc. P.J. Hairston scored 23 points and Reggie Bullock had 15 points with four 3-pointers for North Carolina (16-8, 6-5), which led for the first 26 minutes but went on to lose its second straight. BOSTON COLLEGE 66, WAKE FOREST 63 - B.C. may have channelled the confidence they gained by almost knocking off Duke right at the visiting Demon Deacons. Freshman Joe Rahon recorded 12 points and nine rebounds, and hit the go-ahead free throws with 7.6 seconds left to push Boston College past Wake Forest in Conte Forum on Tuesday night. With the Eagles trailing 63-62, BC got the ball to Rahon who drew contact on his way to the basket. He made both of his free throws to put BC up, 64-63. After the defense forced a Wake Forest turnover, sophomore Lonnie Jackson knocked down two more with 2.5 seconds left to seal the win. Rahon was one rebound shy of his first collegiate double-double and also had four assists. Sophomore Patrick Heckmann recorded 14 points, four steals and three assists and classmate Ryan Anderson scored 12 points. #4 MIAMI 74, FLORIDA STATE 68 - It wasn’t pretty, but the Hurricanes undefeated march through the ACC regular season continued as Shane Larkin scored 13 of his 22 points in the final 7 1-2 minutes to help Miami stave off the Seminoles. It was Miami’s 12th straight win. Reggie Johnson added 15 points for the Canes (20-3, 11-0 ACC), which became the first team to start the league season 11-0 in a dozen years. North Carolina was the last team to start its ACC schedule at 11-0 a dozen years ago. 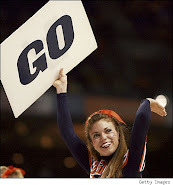 The Tar Heels, however, faded down the stretch of the 2000-01 season and finished with a 13-3 league mark while archrival Duke led by Shane Battier went on to win the national championship.